The utility of modern three-dimensional printing techniques for bio-medical and clinical use has been demonstrated repeatedly in recent years, with applications ranging from surgical modelling to tissue engineering and beyond. Despite the promise and potential of three-dimensional printing methods, impediments to their widespread clinical uptake still remain. Many of the printers used for medical applications are highly specialised pieces of equipment that require trained operators and controlled operational conditions as well as potentially costly and unique raw materials. These factors can result in high production costs, and the necessity of dedicated sites which can in turn lead to delays between fabrication and clinical application. Recent work by engineers and researchers at Zhejiang University in China has shown that desktop 3D-printing techniques may represent a more practical alternative for certain clinical tasks. Desktop 3D printers may cost as little as $500, much less than the $15,000–30,000 machines routinely used in academic institutions. As well as the lower costs, Desktop 3D printers are considered to be much easier to operate. An Liu and co-workers tested the potential of these machines to fabricate bio-absorbable interference screws, used to secure hamstring tendon grafts commonly utilised to repair damaged anterior cruciate ligaments (ACL). A screw-like scaffold, made from the same polylactic acid filament commonly used for conventional bio-absorbable screws, was printed using fused deposition modelling techniques then coated with hydroxyapatite (HA) to improve its osteoconductivity. 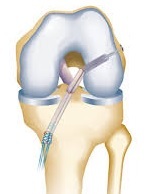 The construct was also coated with mesenchymal stem cells, as these cells are widely considered to be of therapeutic value for anterior cruciate ligament regeneration. A 3D porous structure is considered to be valuable to bone ingrowth into the screw, as this supports the cellular migration and mineral deposition, as well as vascular development, all required as the screw is incorporated into a patient’s bone. Conventional methods have struggled to control to formation of these structures, but by using 3D-printing techniques they can be easily manipulated by surgeons and specialists alike. Once fabricated the 3D-printed screws were tested upon anterior cruciate ligament repairs in rabbits for up to three months. Magnetic resonance imaging showed that all of the 3D-printed screws were correctly positioned in the bone tunnel without any breakage or major complications, and that over the course of twelve weeks they appeared to incorporate into the bone tissue. The successful manufacture of a functional surgical device using desktop 3D printing technology demonstrates the potential for in situ fabrication at the clinic and opens up a range of in-house manufacturing possibilities to clinical staff, circumventing the requirement for costly equipment and bespoke materials as well as trained specialist operators.